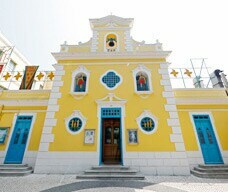 Built in 1928, this chapel follows the baroque style of Macao's major churches. It has a cream and white facade with oval windows and a bell tower. It stands behind the monument commemorating the local victory over pirates in 1910. 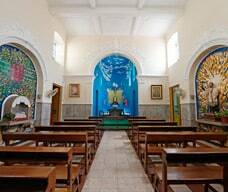 The chapel contains some of the most sacred relics of Christian Asia. In a silver reliquary is a bone from the arm of St. Francis Xavier, who followed his missionary successes in Japan by coming to the China coast, where he died in 1552 on Sanchuan Island, 50 miles from Macao. 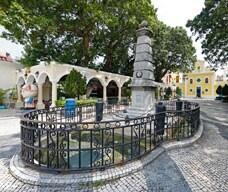 The relic was destined for Japan but religious persecution there persuaded the church to keep it in Macao' s St. Paul' s. It was moved first to St. Joseph′ s and in 1978 to the chapel. Persecution of Christians in Japan led to 26 foreign and Japanese Catholic priests being crucified in Nagasaki in 1597 and many hundreds of Christian Japanese being killed during the 1637 Shimabara Rebellion. The bones of the Martyrs and some of the rebels were brought to Macao and kept in St. Paul' s. After fire destroyed the church, the bones were gathered and taken to the Cathedral. They were moved to St. Francis Xavier Chapel in 1974. Other bones stored in the chapel are relics of martyrs from 17th century Vietnam. A few years ago, the relic was taken to St. Joseph' s Seminary and the Sacred Art Museum, but many people still come to this Chapel, especially Japanese Christians. Opening hours: 9:30 a.m. - 5:30 p.m.